Home » Animals » Aquaculture » Which fish should be farmed in SA, and where? Here’s an overview of where in South Africa certain types of freshwater aquaculture are feasible. This is in response to many enquiries from interested farmers on whether certain species can be farmed on their land, and if so, how. The most successful aquaculture species, trout, are severely limited by two factors: suitable water and temperature. Trout, originating from cool, clear, fast-flowing river systems, find themselves in a hostile environment in our widely seasonal climate. Trout will not survive temperatures greater than 21°C for any length of time. And even if a lower temperature can be maintained, the lack of oxygen is a limiting factor at high altitudes. Therefore trout, be they for angling or aquaculture, are unlikely to be viable in any area other than where they are now. Tilapia are a more complex issue. The species of most interest to aquaculture (Oreochromis niloticus, O. mossambicus and Tilapia rendalli) are severely limited by low temperatures. O. niloticus and T. rendalli will not survive for long at below 12°C. Given the high altitude of the South African plateau, this rules out about 60% of the country. 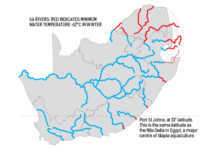 The map alongside provides an idea of where low river temperatures during winter months would exclude tilapia. Even in warmer areas, such as the Eastern Cape and KwaZulu-Natal coastlines, periodic extreme cold spells can reduce water temperature to lethal levels, resulting in mass mortalities of these species. 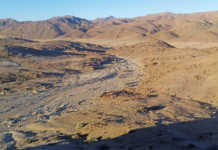 Under aquaculture conditions, provision can be made to accommodate such short-term cold spells, as Egyptian famers have shown with ponds that feature deep thermal refuge areas, tunnels over part of the ponds, or seasonal farming of the fish that allows for a ‘fallow’ period. Despite this, I would maintain that those parts of South Africa that experience extreme frost are unlikely to be economically viable for tilapia culture. 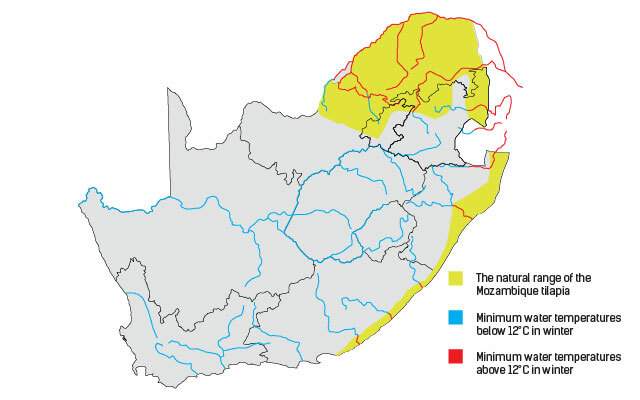 This effectively includes much of the Highveld in the Free State, western Mpumalanga, the KwaZulu-Natal Midlands above 1 500m, and the mountains and drier hinterland of the Eastern and Western Cape. Suggestions have been made by state departments that the Queenstown area be developed as an aquaculture ‘hub’. In terms of temperature alone, this makes little sense, with water temperatures of over 25°C during summer prohibiting trout, and below 11°C during winter disallowing tilapia. Ornamental fish culture is more tolerant of widely ranging temperatures, as containments tend to be smaller and control is easier. However, even in tunnels, raising the temperature of large bodies of water using energy is expensive. Why not Bass and Carp? 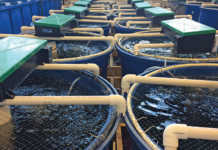 Do recirculating aquaculture systems (RAS) provide the answer? To a limited extent, yes, except that for significant production to take place, the set-up and operating costs as well as the level of technology and skills needed have to be very high. There is also the risk of losing the entire stock should something go wrong. It is a pity that alien fish species such as bass and carp are not regarded as suitable aquaculture candidates in Southern Africa. As they can survive in water between 4°C and 33°C, they would be ideal for local conditions.